It’s concepts like GSBTB, new ways of living and working and social projects that give the city its unique community. One of these is After School Hustle by Pawel Mordel, a youth training programme. I’ve known Pawel since my party times 10 years ago, and since we are all growing up (at least in some areas) we’re all working together on shaping our society for the better. I spoke to Pawel about After School Hustle. Pawel, what exactly is After School Hustle? It’s a non-profit youth education programme that we started last fall. We want to provide new opportunities for teenagers to reach their full potential. The key is to teach them skills that are relevant for today’s economy and to show them inspiring examples of what can be done. What classes are you offering and how do they work? Our classes always follow the same format. There is a brief introduction to the coach, what they do and how they got there. Then we explain some basic stuff and go straight into practical work. For the film class with Boris Saposchnikow (http://ifeelfine.tv/) we shot a music video for Fritz Helder, who is not only a musician but also a dancer. Having him around provided great energy and professionalism. But also something like spreadsheet modelling (i.e. working with software such as Microsoft Excel) can be made interesting. The key is to make it relevant for the lives of the teenagers. The coach here is Marcel Mandry from the streetwear label OPM. He uses his experience to explain elemental business concepts and teach the participants how to deal with the financial side of their projects. We also offer a sports programme: After School Muscle. Starting on Saturday 24 March we will offer daily workouts with experienced trainers. Of course this programme is also free. One of the major issues of education today is the lack of teachers. At the same time, there are more and more highly qualified people who have the desire to work with teenagers occasionally. Technology now allows us to set up an organization that can bring those people in to create interesting learning experiences. So basically we realized the major shifts around us and saw an opportunity to create a meaningful project. Are there not enough after school programmes in Berlin? When you talk to practitioners in the field, everyone is complaining about the cut-backs in public funding for after school programmes. But the most important feedback is of course what the teenagers say. Thus far all participants are really appreciating our programme and telling their friends about it. So we believe that what we offer is relevant and fresh. What is wrong with the German/international education system? Traditional schools remain highly important, but they cannot provide everything that teenagers need. Our concept is to provide additional opportunities for those teenagers who are not able to develop their full potential through regular school. In particular, we bring in highly accomplished practitioners from fields such as photography, illustration or writing to lead our workshops. These people are not only able to teach skills in a very relevant way, but can also show the options that life has to offer. How do you keep your street cred in the teenagers’ eyes? The selection of coaches is very important. They have to be able to relate to our participants and show them all the cool stuff that they are creating on a daily basis. We do not do lectures at a distance. Rather, every class is a working session where we interact with the students on eye-level. What is the most rewarding part working with teenagers? Our coaches teach skills that they have mastered and use on a daily basis. So they often take them for granted. Working with teenagers can show them how much they have learnt over the years and it is very satisfying to pass that knowledge on to the next generation. The impact is really tangible. How can parents, individuals and teenagers get involved? We do this for the teenagers of Berlin. So we want them to come to our classes and to tell their friends about us. Reaching as many teenagers as possible is our main concern. 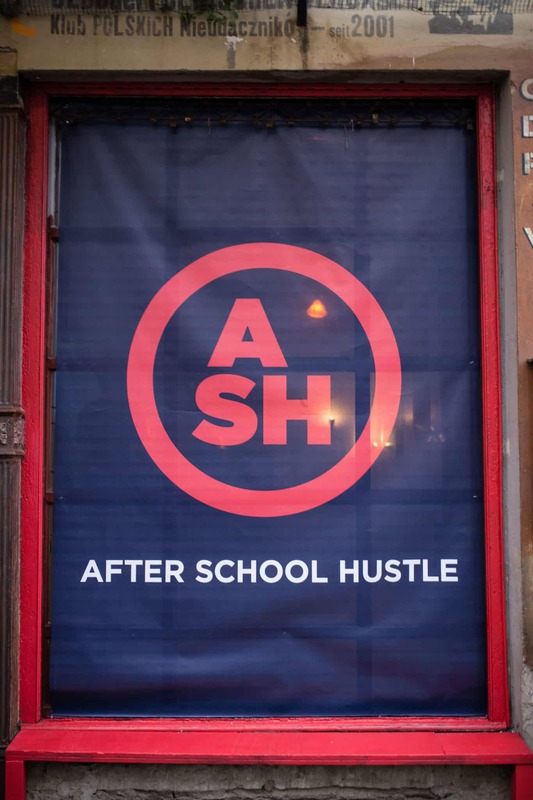 What’s the future for After School Hustle? Our core activity is creating classes. So we want to progressively create more of those. Currently we offer one class every Saturday. But we need to do more than that. After School Hustle should become a household name such as the boy scouts for example. We want to be a permanent programme that provides a significant array of classes. For our readers, how can they help/get in touch/get involved? If you want to go beyond spreading the word and encouraging teenagers to come to our classes, you can make a charitable donation. We are a privately financed operation, so hitting the donate button on our website contributes to the success of the programme in a significant way. Visit After School Hustle’s website. After School Hustle on Instagram. Next Article The House of Red Doors: The Circus is Back!